The Dell Computer Support Center tool helps you to maintain your PC in real time. There are lots of options within this tool that is confusing to the everyday home computer user. This is the 3rd of a 3-part series on the *My Dell software. It is a continuation of Part 2. Here we continue to look at some of the features I think are useful for you. 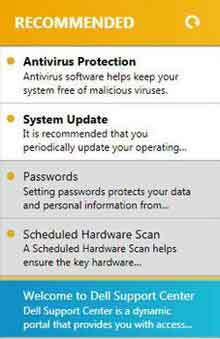 We look at things like the Scheduled Hardware Scan, Hard Drive Status and Help And Alerts. Part 1 shows how to download, install and load the latest version of the software. This tutorial includes lots of supporting images to help you use software. The Table of Contents links below gives you the choice to hop to the part of the article that interests you the most. Step 4 gives you the opportunity to share your experiences. Which tools available through the Support Center do you use? How do you setup your Scheduled Hardware Scan? Step 5 enables you to jump directly to the experiences shared by other visitors to this web page. Software improves and evolves over time, and so does the features and options included in this application. I am no longer in possession of a Dell computer, therefore I am unable to update the images or additional options provided with the latest version of the My Dell software. Please note the instructions provided on this page is not significantly different from the latest software versions. I believe the information provided here is still a useful guide. The 'Recommended column' of the application tool is based on the current status of your own Dell computer. Once the software scans your computer, the Recommended Column populates with urgent and suggested tasks. Click the Scheduled Hardware Scan option in the recommended column. Click Run Test. This option scans the main components of your Dell computer - Network Card, Memory, Motherboard and other hardware components. The software retains the outcomes of previous scans for your convenience. Internet Connection Status displays your connection details and gives you the option to run a hardware test. 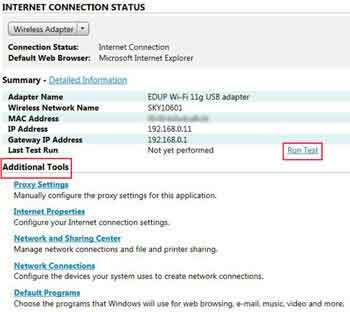 Additional Tools are linked directly to Microsoft Windows and Internet Explorer settings, such as Internet Properties and Default Programs. The Hard Drive Status option tells you whether your hard drive is performing as expected or not. 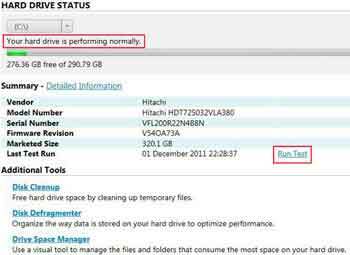 It provides some technical information and gives you the option to run a Hard Drive test. Additional Options are shortcuts to your operating systems hard disk management tools, such as Disk Cleanup and Disk Defragmenter. In this final section we look briefly at the Get Help, Alerts and Schedule options. The Get Help option presents several shortcuts to the Dell web site which saves you search time. The right hand side also presents direct links to several Dell Technical Support and Customer Support options. Take a moment to look at each of these options. I find the Online Tools and Community Forums to be very good sources of information. The Settings option is where you setup your Alerts and Schedules. 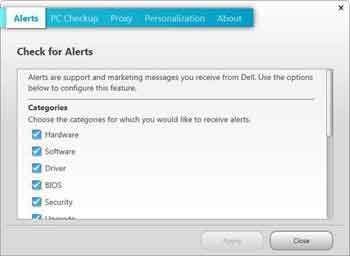 The Alerts option is where you setup the application to alert you about any specific computer component, such as the driver updates or security issues. Alerts appear in the Recommended Column. 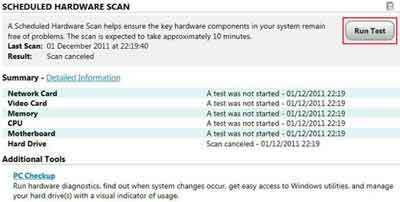 Click the PC Checkup option to schedule your computer hardware scans. In the image below you see a variety of choices available. The default settings in the image are sufficient for most home computer users. This completes the discussion on the Dell Computer Support Center tool. I hope it proves helpful to you and your family. Maintaining your home Dell computer yourself means you can rely less on Dell Computer Customer Service, saving yourself money in the process. If you would like to learn more about troubleshooting Dell Computers, go to the Dell Support web page (Opens New Window). How do you setup your Scheduled Hardware Scan? Which hardware components do you schedule for scanning? Which Tools available through the Support Center do you use? In what circumstances do you use them? Enter Your Title e.g. "FAQ Is The best Place To Start"